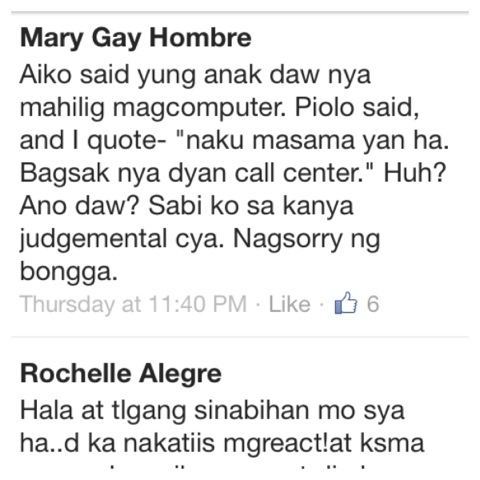 Fierce Blogs: Piolo Pascual Has Something Against Call Center? Share I was browsing FB and stumbled upon a status update from a colleague. To give you a background, the cast of ABS-CBN's teleserye is shooting some scenes in our office building. The discussion you are about to read took place inside the lift with Piolo Pascual and Aiko Melendez inside. 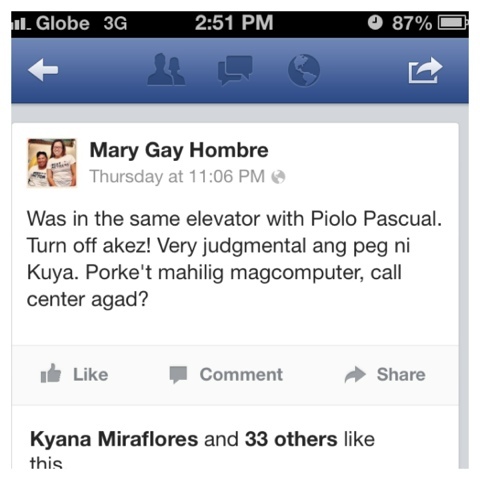 You be the judge if you think the comment of Piolo Pascual is offensive... If you ask me, the tone of Piolo Pascual sounded derogatory; which is also the reason why he apologized immediately inside the lift. Well, more of when he was told after of being judgmental. What I heard also is that he asked his PA to look for Mary Gay Ombré to apologize again. Moral of the story... Keep your opinions to yourself, most specially if your opinion might potentially hurt people's emotions "around". Pero I think what he was trying to imply is, not having a good study habit can limit your options thus the bagsak call center comment. Goes to show that he may be a heartthrob but he lacks brains. The girl should have said that he should stick to acting because that's all he's good and keep his observations to himself because it's pretty obvious that he lacks logic. what do you expect, limited lang kasi ginagalawan ng mga artista, di sila aware sa mga ganyan, lalo na sa level ni Piolo na busy, kung ano lang ang narereceive nilang impormasyon ganun lang ang pagkakaintindi nila. give him a break. OA lang si ate magreact, nagmamaganda masyado, big deal kagad teh? misleading din ang title nitong blog, something against call center? may sinabi ba si Piolo na masama sa call center? concern lang siya sa future ng bata, puro computer kung ganun malaki ang posibility na makakahiligan niya talaga ang call center kasi dun siya sanay, magcomputer. dun ang skill nya. matalinong tao si Piolo sa field niya, pero sa ibang field hindi just like normal people. may strengths at weakness. It's not a point of whether he knows the BPO industry or not coz everyone's entitled to their own opinion naman.. It was rude lang coz he was inside a building leased by a call center.. of course, any call center employee will get offended by what he said. oh well, I think he realized that naman agad kaya he apologized..
Ang arte mo naman mag react! Pati mga call center agents ganyan mag joke! My gosh! Siguro tawagin ka lang pangit, iiyak ka na! Ikaw ang nagbigay ng masamag kahulugan! Kung ang bata mahilig manuod ng greys anatomy, malamang doctor ang bagsak nyan! Ganun lang yun! wag ka pa emas! Kung ang bata mahilig kumanata, malamang Singer ang bagsak nyan! Walang masama dun!